Two teenage vandals responsible for up to £100,000 worth of graffiti damage across the south east of the UK have been ordered to be detained. 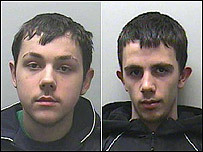 James Buckett, 19 and Luc Hunter, 18, attacked trains, trams and railway bridges in Croydon and Orpington, Kent. The pair pleaded guilty to criminal damage at Guildhall Crown Court. Buckett, from Warlingham, Surrey, was given two years in a young offenders institution. Hunter, of Crystal Palace, south London, was given 18 months. 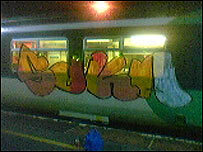 Their spree - between January 2004 and early this year - involved spraying graffiti for nine hours a night, week after week. The court heard how they were so proud of what they were doing that they could not resist taking a host of incriminating pictures of themselves wielding an array of spray cans and leaving their so-called "tags". But it was these pictures that led to their arrest after staff at a photo development company gave police the lead they needed. This helped them identify James Buckett who was found to have further images of the damage on his computer when police searched his home in Church Lane, Warlingham. Although he went on the run after suspecting police could be closing in, one of the pictures also helped officers catch Hunter, of Waldegrave Road, Crystal Palace. In one incident, they targeted four trains at Orpington railway depot in Kent. It took 1,200 man hours at a cost of £19,000 to clean off the paint. Seven of the carriages had to be taken out of service while the work was done. Passing sentence, Judge Paul Worsley, QC, said the graffiti campaign "became such an obsession you spent three nights a week from 10 in the evening until seven in the morning going about your so-called work". Buckett pleaded guilty to 10 charges of criminal damage and asked for 62 similar offences to be taken into consideration. Hunter admitted eight criminal damage counts and asked for 14 others to be considered.